It’s time for another update from the world of Purchasing. This time I’m looking at Coffee; a very important beverage in our business. It provides excellent margin opportunities and if we do it well a tangible point of difference from our competitors. High Street Coffee brands (Costa, Starbucks, Nero) do a good job in providing consistent coffee quality combined with a varied seasonal menu offer. As a result our customers expect to have a choice of popular Espresso – based drinks such as cappuccinos, lattes, macchiato or Americanos delivered to High Street standards in our outlets. If we are looking to create an urban coffee experience, we must enlist the support of specialist suppliers who can provide conceptual ideas often to our client’s individual wishes or a bespoke brand to roll out across the business. What equipment do we invest in? A good quality Espresso machine will be important for an artisan coffee bar or fine dining staff restaurant. A super automatic machine is more appropriate in busy staff restaurants or conferencing areas to avoid queues at peak times. These machines still use fresh beans so customers can still enjoy the aroma of freshly brewed coffee. For conferences and large meeting areas where there everyone wants their beverage at the same time, the coffee pouch systems is available. This coffee system uses a pre-ground coffee pouch (like a giant tea bag) that is loaded into the top of the machine .The instant water system will deliver freshly brewed aromatic coffee in just seconds. Stored in an Air Pot or insulated flasks the coffee will remain at drinking temperature for 3 – 4 hours. For low volume areas there is the pod system delivering a cup of coffee of consistent quality by recognisable brands (Nespresso, Tassimo). The pod is loaded into the machine and the system will deliver freshly brewed coffee to go in just seconds. This is ideal for reception areas meeting rooms and directors office suites. 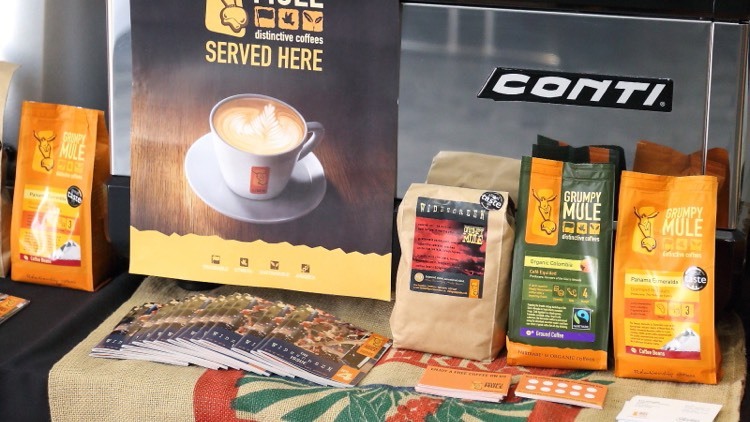 In terms of coffee choice many businesses (including ourselves) use an exclusive coffee brand (I.E. Grumpy Mule). This route means partnering with an artisan roaster (in our case Bewleys). Ethical criteria (Fairtrade, Rainforest Alliance) and/or Organic have become standard expectations of our clients and customers. Don’t forget the training – this is a critical element. With a traditional espresso machine the in-cup quality of the finished drink is dependent on the skills of the barista. The chosen coffee supplier is expected to offer barista courses to include operating the grinder, foaming the milk and ensuring the correct water temperature. Not investing in staff training is a false economy because a poor cup of coffee can ruin the customer experience which in turn can result in a loss of customers increased complaints and an unhappy client.